I shouldn't be telling you this, but we Aussies love to scare tourists with wild stories about the dangerous animals of Australia. There are some dangerous animals in Australia, they live mostly in the oceans surrounding us. But on land? Don't worry, read the information on this site and use a bit of common sense when travelling. You will be perfectly safe. 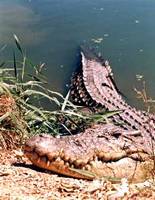 Saltwater Crocodiles are cunning animals that stalk their prey and hide just below the surface. They are fast as lightening when they do attack and they are a lot more dangerous when you don't see them than when you do! By the way, that doesn't mean you can't swim up here. There are many freshwater creeks, rock pools and waterfalls for swimming. If in doubt, ask. You can find out more about dangerous animals of the oceans in the Australian animals section. And that are the only really dangerous creatures in Australia. In a way, the further inland you go, the safer you are. You see, the whole "dangerous Australian Outback animals" thing is a bit of a myth. Snakes? They are not dangerous to you if you use some common sense and follow the guidelines spelled out on the Australian snakes page. Snakes will not attack like crocodiles do, they only pose a danger when provoked. You can read more about Australian snakes and how to avoid them here. The Sydney Funnel-web Spider appears only in and around Sydney. Its venom can be dangerous to frail and weak people or young children, but nobody has died from a bite since antivenom was introduced. The last death occured in 1979. The much touted Redback Spider is not deadly. A bite can cause great discomfort and makes some people sick, but it doesn't kill. Heck, I've even been approached by people who were worried that a dingo might attack them. Honest, there is a bigger chance of your pooch attacking someone than of our dingoes causing you trouble. The "dingo attacks" you read about are actually attacks by hybrids, crosses between dingos and domestic dogs. You can find a lot of hype and sensationalism about those venomous creatures, but it is just that. Hype and sensationalism. It gives Australian Outback animals a bad name that they don't deserve. The only truly dangerous creatures live in the water, not in the Outback. Return from Dangerous Australian Outback Animals to Outback Australia Travel Guide home page.